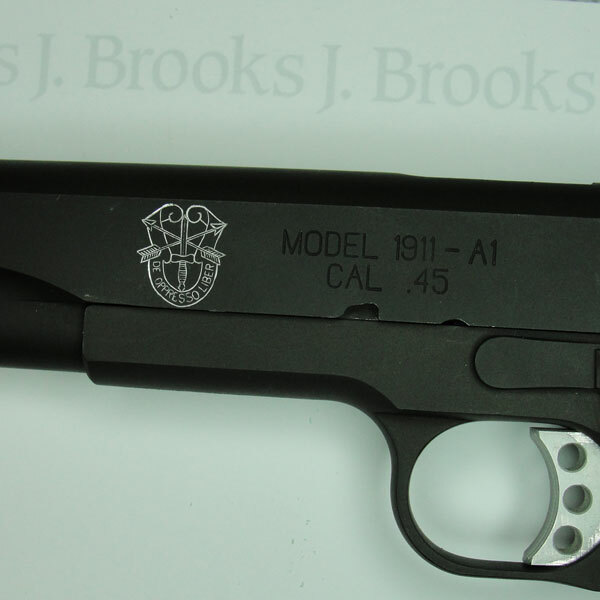 Custom engraved Springfield 1911 Range Officer. 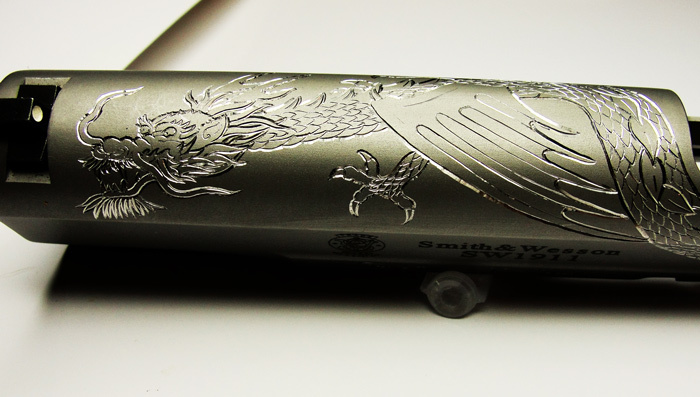 Hand Engraved with a dragon in a set of 4 for a 10 year anniversary celebration. 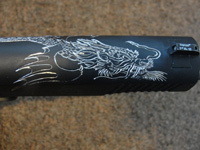 Each dragon hand engraved to be the same kind only a little different from the last rest. 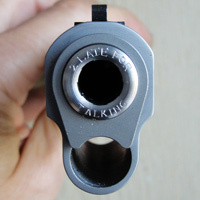 Custom engraved barrel bushing. 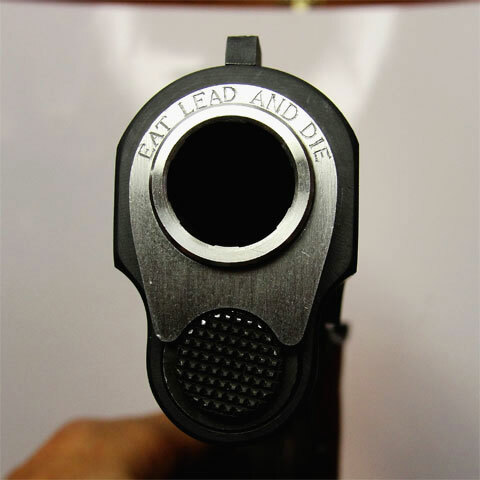 The words say it all. Got a good idea let's put it on your bushing. 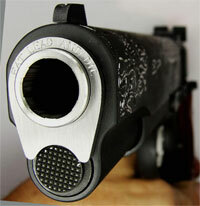 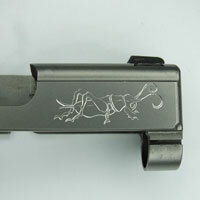 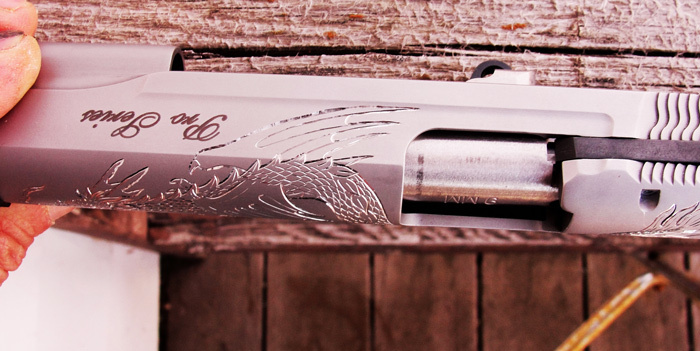 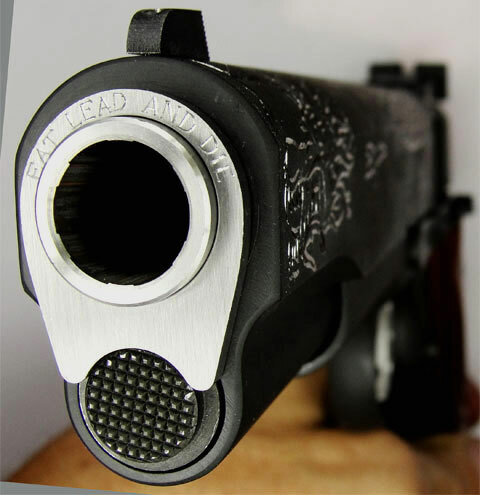 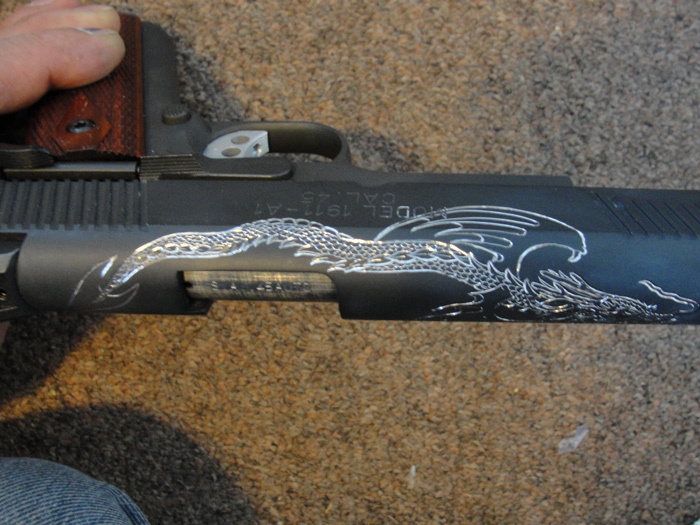 Rick contacted me and asked if I could put a cool dragon on the slide of this Smith & Wesson 1911. 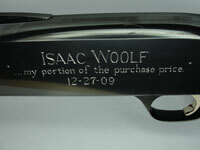 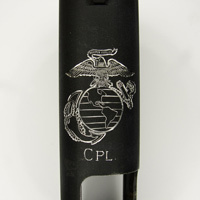 He wanted his son's name and also a little flourish on the end of the barrel in the photo below. 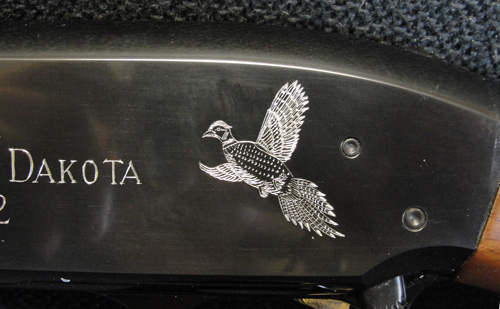 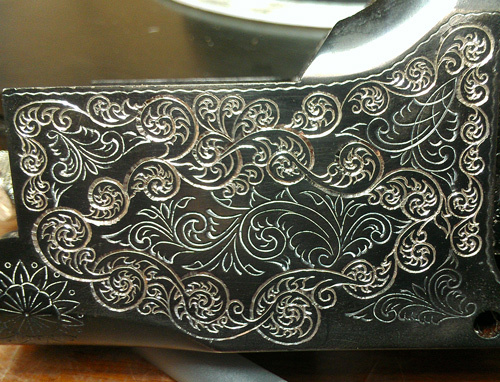 I was asked to engrave scrolls in the open spaces on this Browning Citori Receiver. 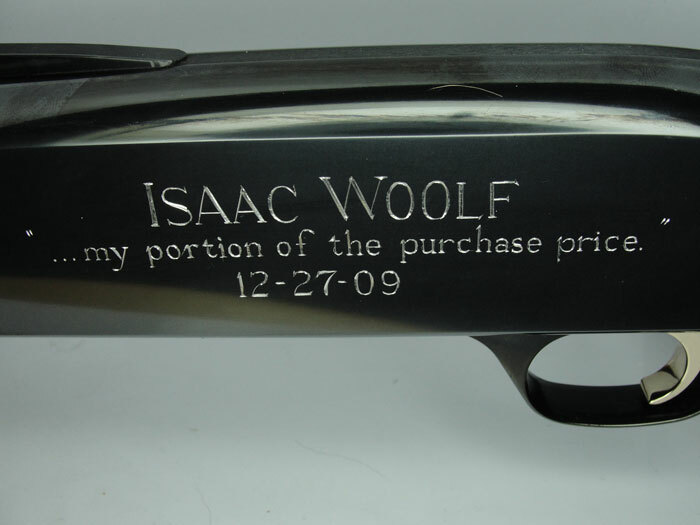 Where the factory engraving was not. 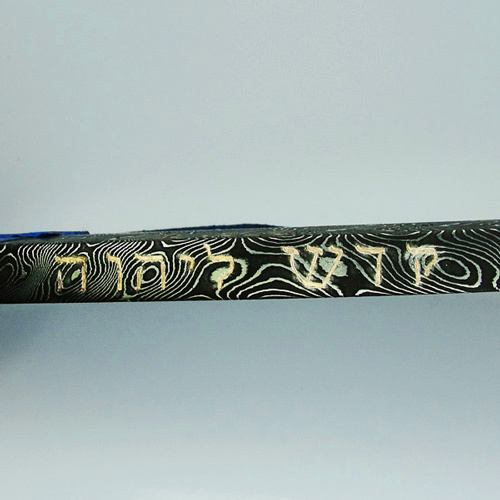 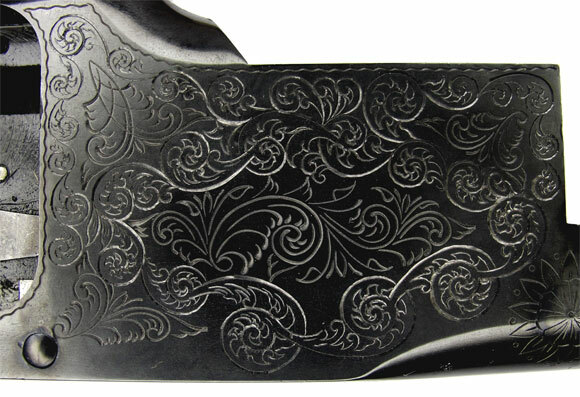 On the bottom is an engraved pattern that is quite different than the typical western scroll engraving. 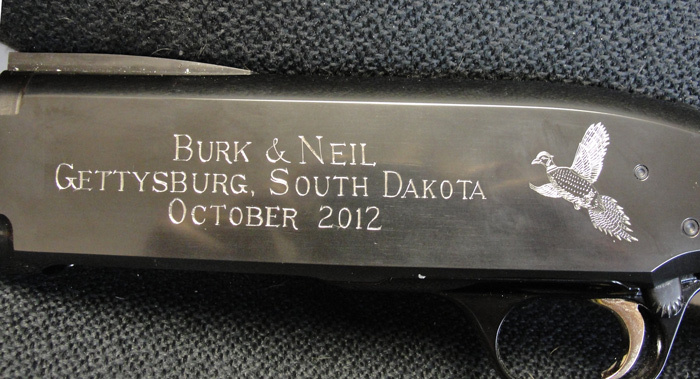 Custom engraved barrel bushing. 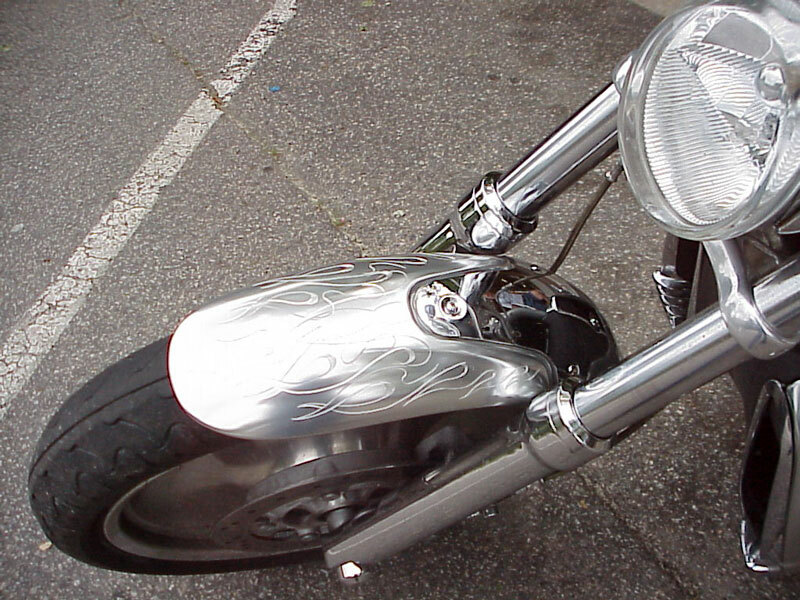 Sometimes a good idea is just the right thing to do again. Got a good idea let's put it on your bushing. 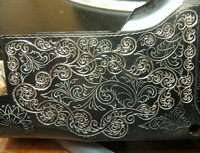 Just finished cutting the side of this Browning Citori. He wanted some scrolling to fill the rest of the receiver. 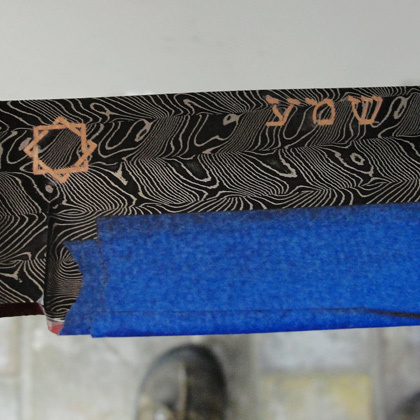 Will post pictures of the whole piece once it is blued. 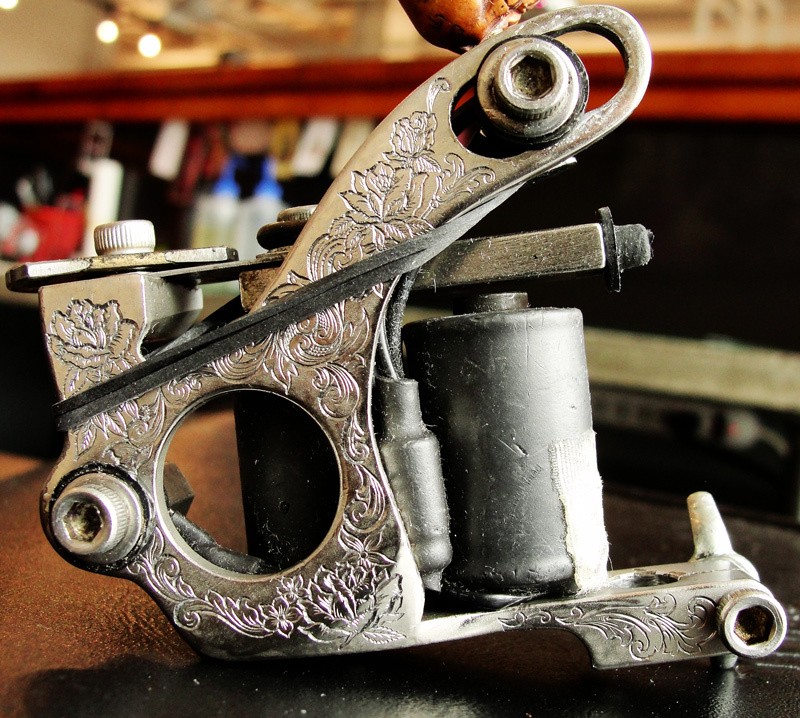 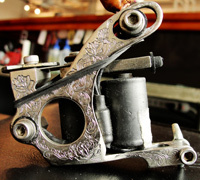 I had the privilege to engrave my friend Bonnie Seeley's favorite tattoo machine. 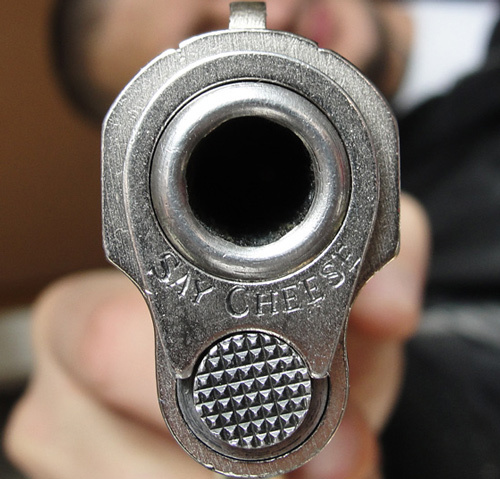 she told me make it look cool and this is what I did. When I engrave something I put a white watercolor paint on the piece draw the design on the painted surface with really sharp pencil to create the crispest layout lines. Once the design in approved I take a small chisel called a graver and cut the drawing into the metal.Buff of the paint and you have an engraved piece. 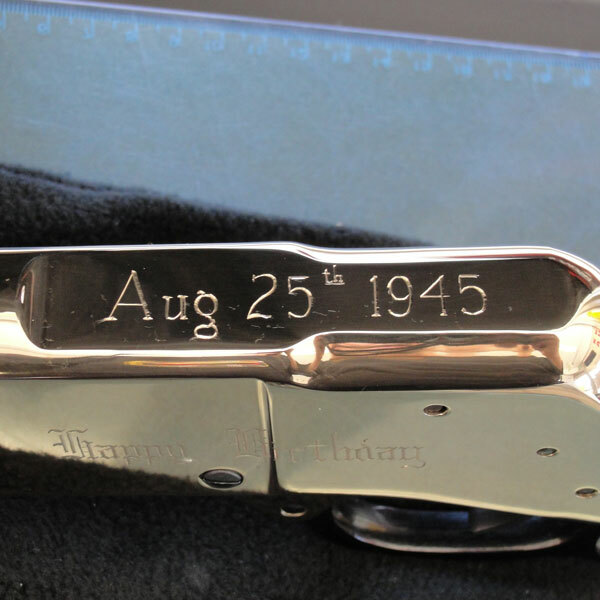 His grandpa's 80th birthday present. 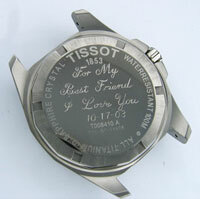 It has is Brand and something to show his love for barbed wire. 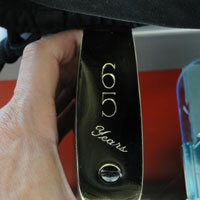 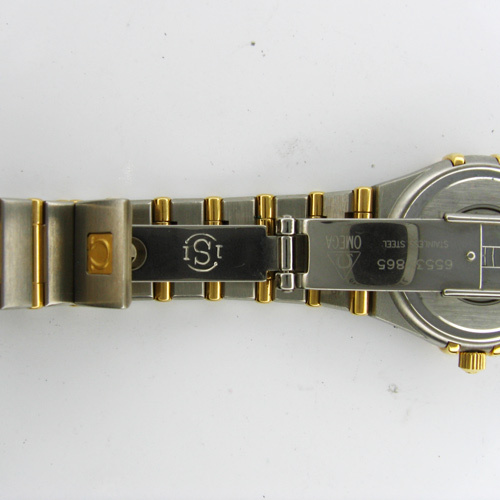 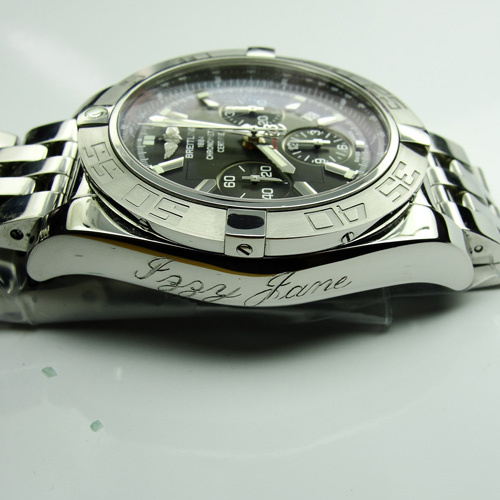 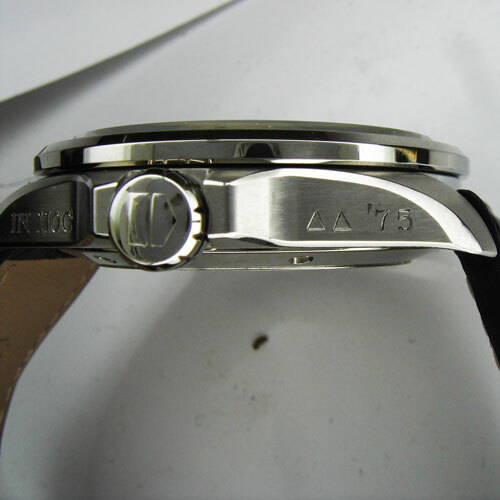 This is a Tag Heuer that engraved to signify milestones in the person's life. 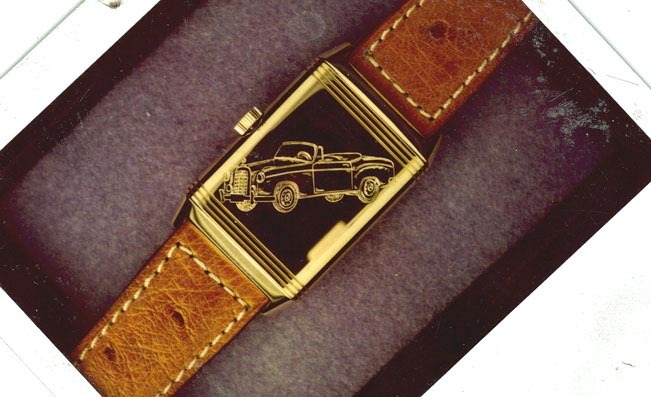 This gentleman brought me a picture of his 1957 Mercedes Benz and wanted me to engrave it on the back of his 18k Jaeger Lecoultre Reverso. 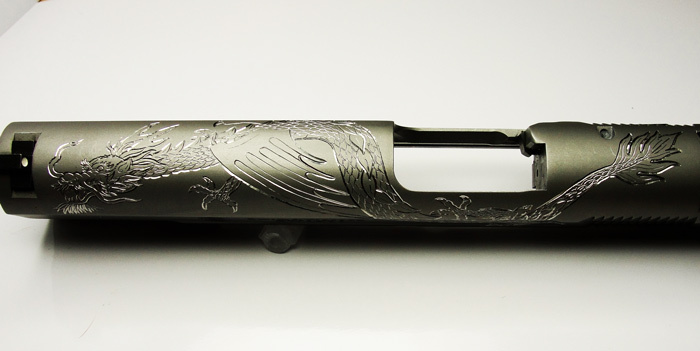 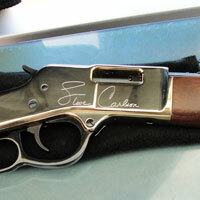 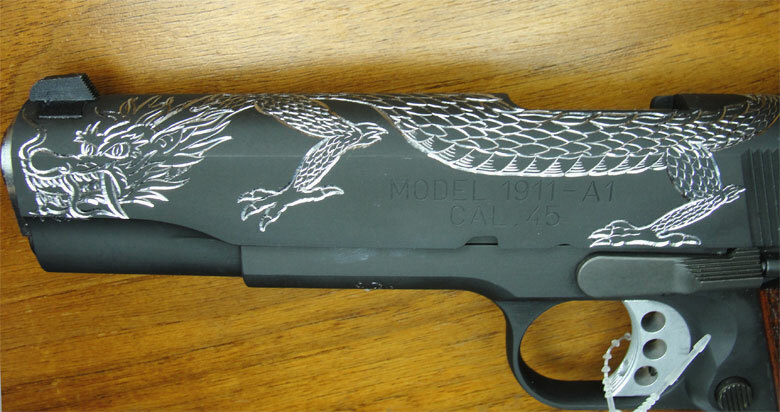 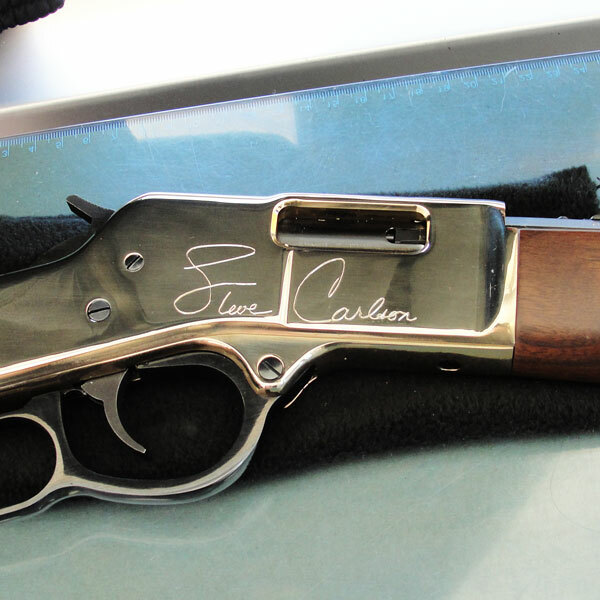 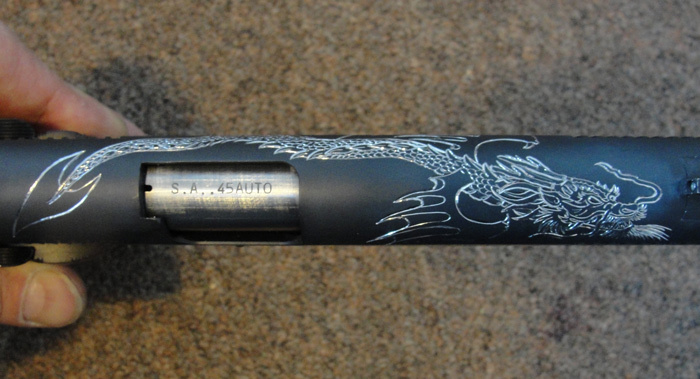 This is the other side of the shotgun. 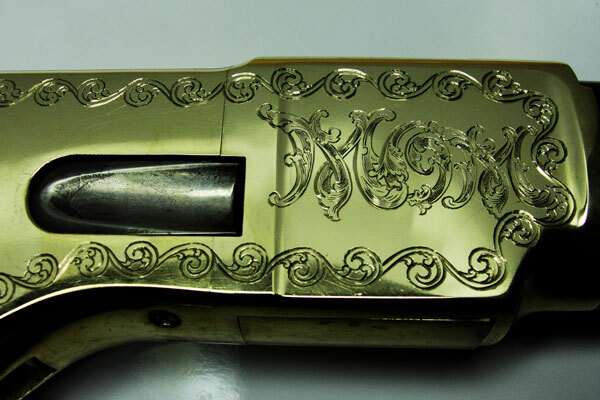 The right side of an engraved henry golden boy rifle mom is the word engraved on this side. 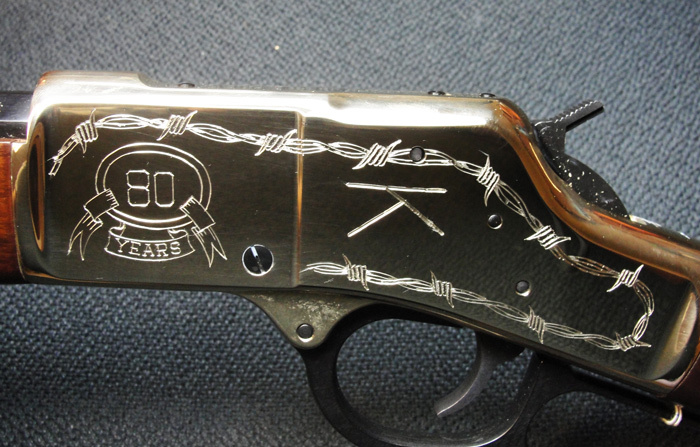 The left side of the same henry golden boy with angel engraved on it. 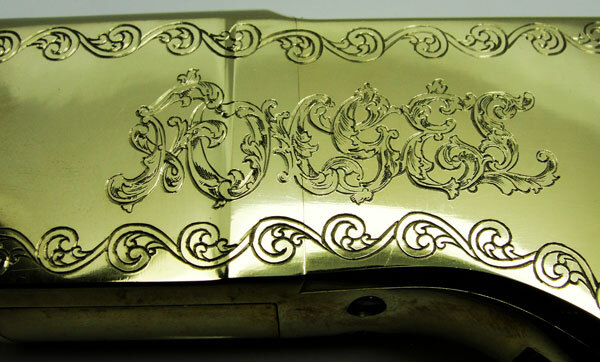 The left side of the same henry golden boy with angel engraved on it expanded view to show more of the scroll. 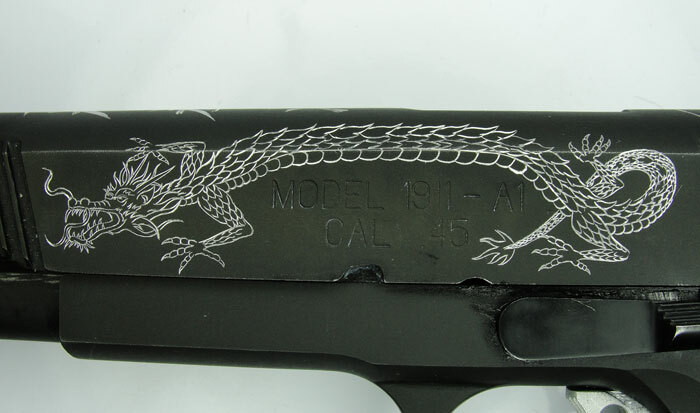 This 1911 Springfield belongs to a karate teacher and he wanted it to reflect a Shaolin Kenpo theme. 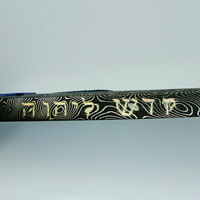 The front part of the top of the slide Shaolin Kenpo kanji. 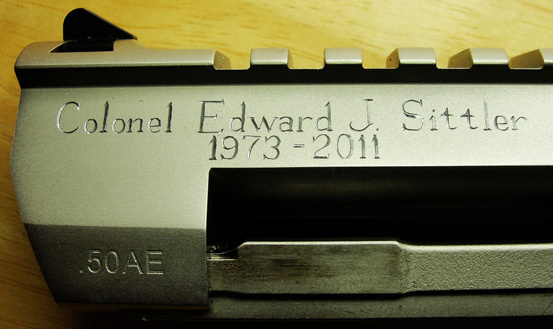 This is the full view of the top of the slide. 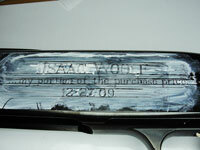 This is the back of the slide in front of the rear site the USSD bonsai tree. 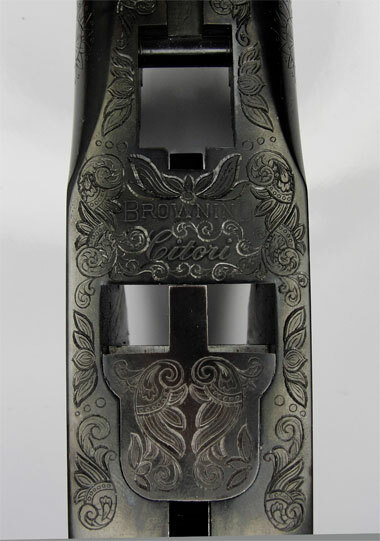 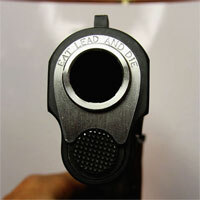 This pistol belongs to a local tattoo artist she gave me three pictures and told me where she wanted them to be put on her pistol this is the design she wanted to have on the front top of the slide. 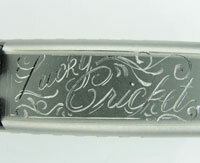 This is cricket she wanted on the side of the slide. 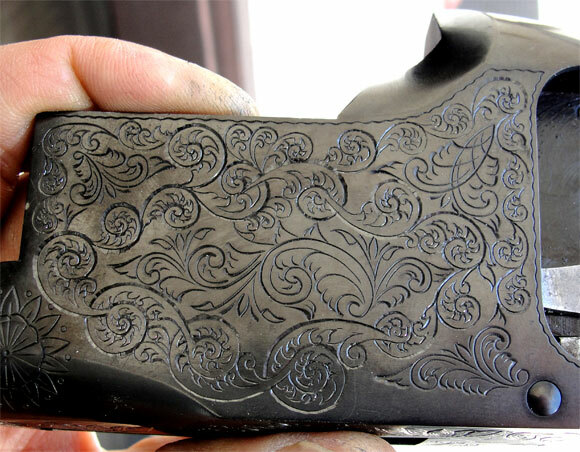 This is the back half of the slide. 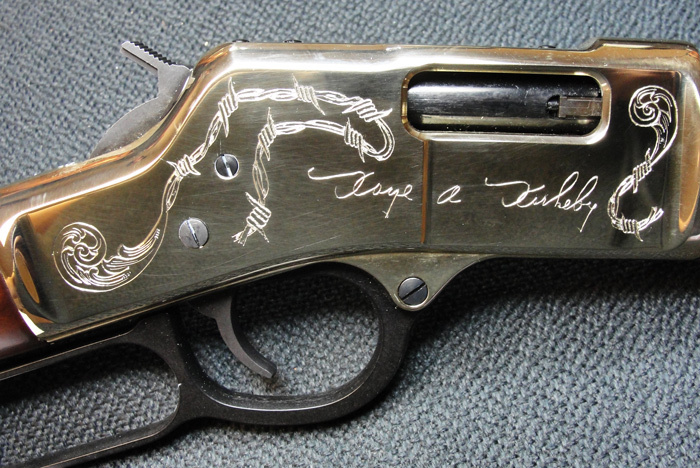 Engraved signiture on side of Henry Golden Boy. This is the top of the Henery Golden Boy. 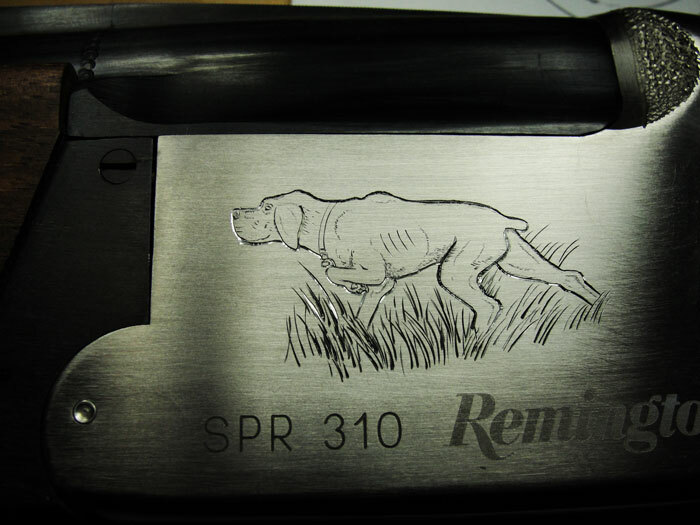 This is the back plate of the Henery Golden Boy. 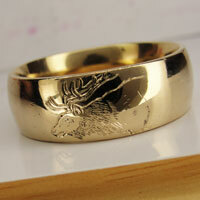 This is an elk head and neck that I engraved on the outside of a 6mm men's band. 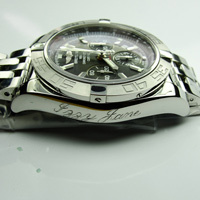 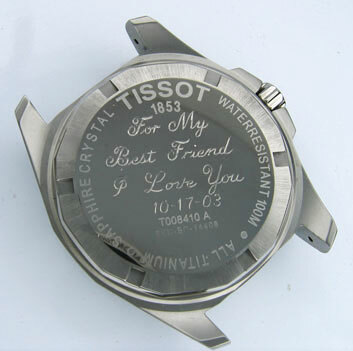 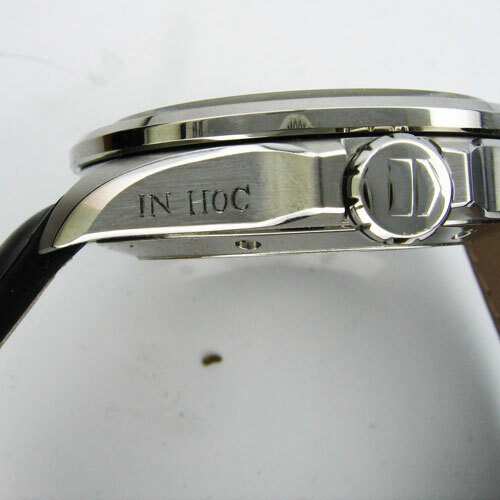 A note engraved on the back of a watch with a script specified by the client. 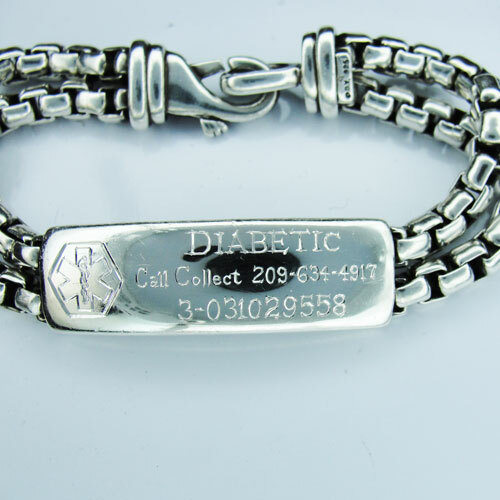 This is an ID bracelet that we ordered in, and then I engraved all the medic alert information on the front and personal information on the back of the center strip. 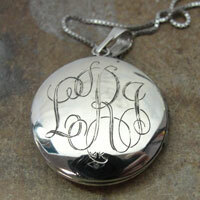 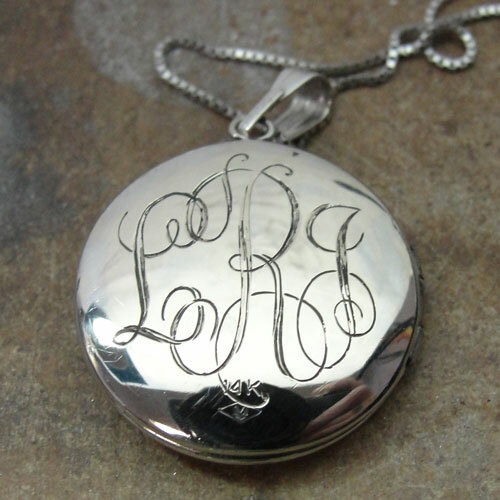 Here we have a white gold locket that I engraved a vertical script monogram on the front. 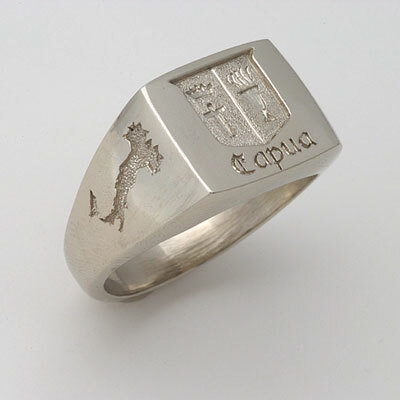 This men�s ring was sent to me with three surfaces plain and highly polished. This is the finished ring after being engraved. 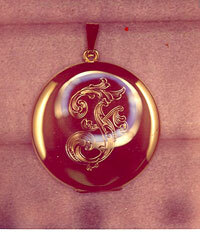 This was a fun project 18k yellow with platinum scrollwork. 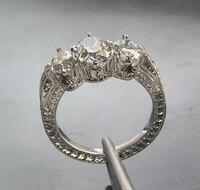 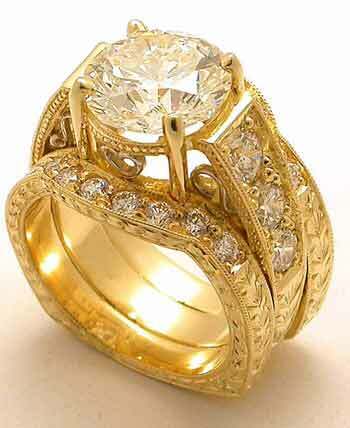 Engagement ring was to be made as a semi mount and the four caret was to be set locally. 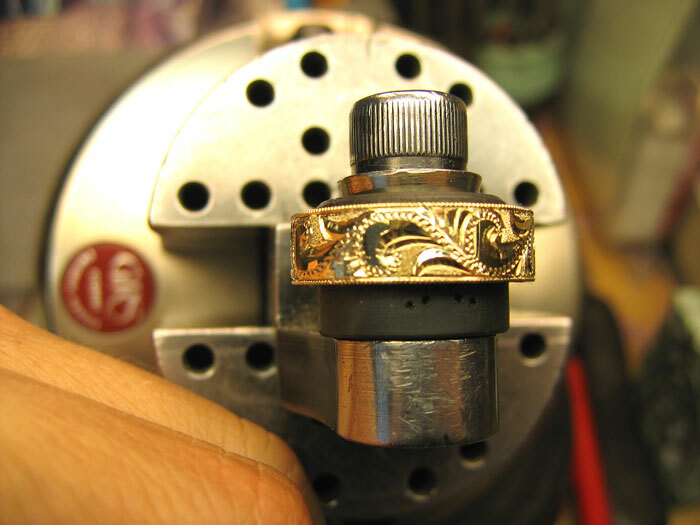 This is the three-piece set, after sizing and setting the center. 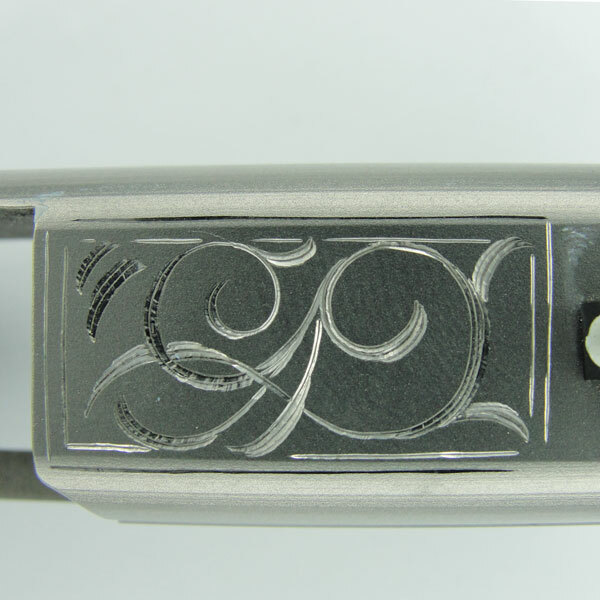 This was one where the client knew a little about how they wanted the ring deep engraving on the out side perimeters and shallower more detailed engraving on the profiles. 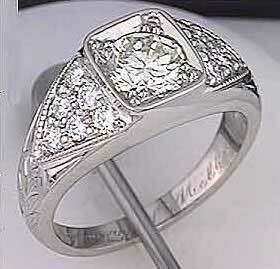 Platinum and diamond melee. 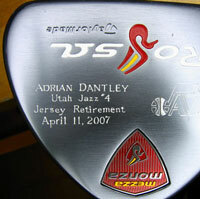 This is a golf club that I engraved as part of the ceremony for the retirement of Adrian Dantley�s number with the Utah Jazz. 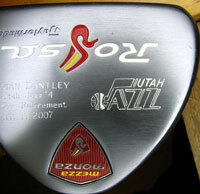 This is another view of the golf club in the section above. 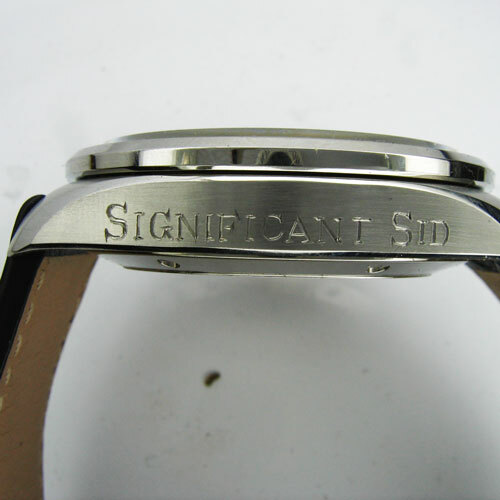 This is an example of the slant script that I engrave on the inside of bracelets and rings. 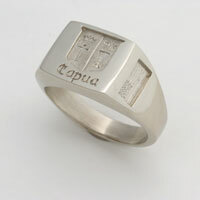 This is an example of the roman block that I engrave on the inside of bracelets and rings . 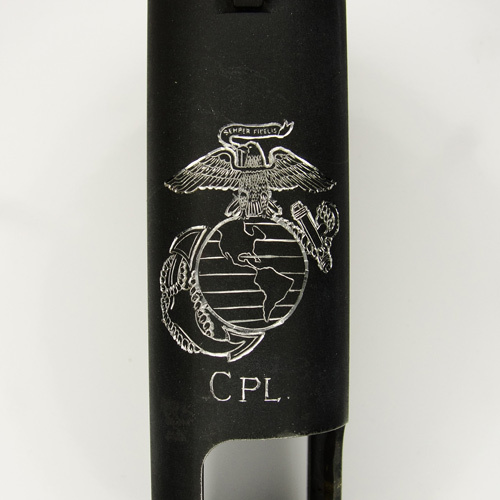 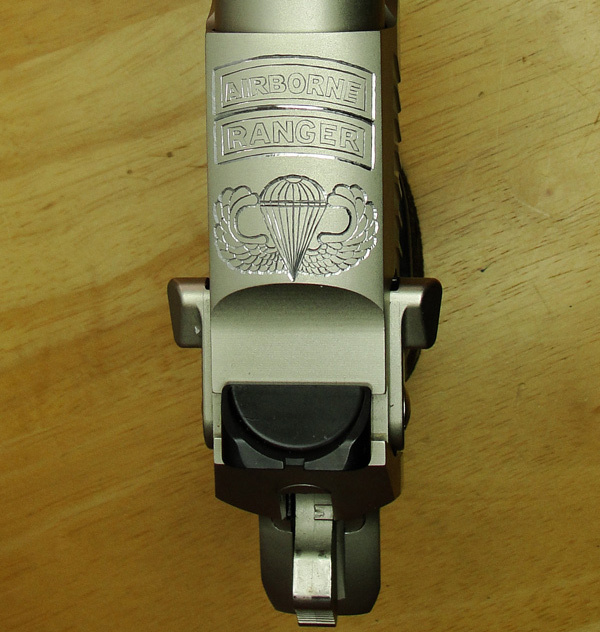 This is a little engraving project that I did for one of my Green Beret, Special Forces friends. 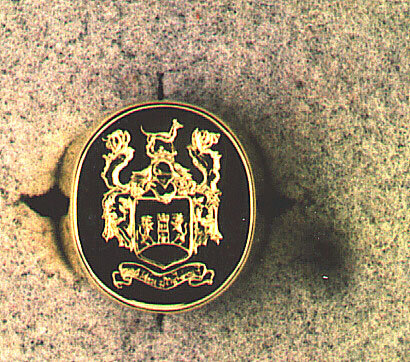 The Van Beuge Coat of Arms hand engraved on a belt buckle. 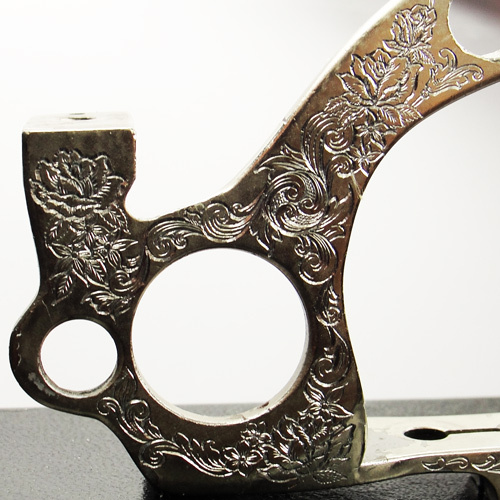 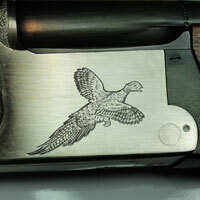 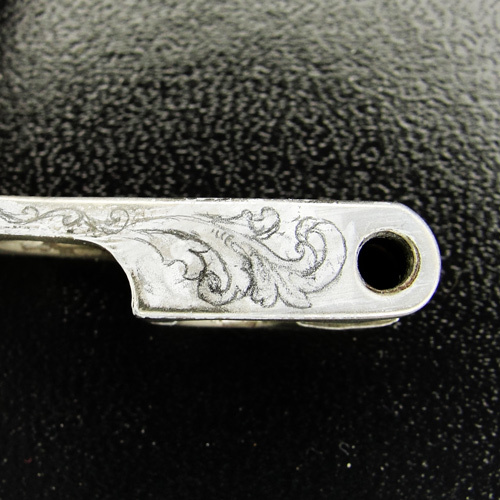 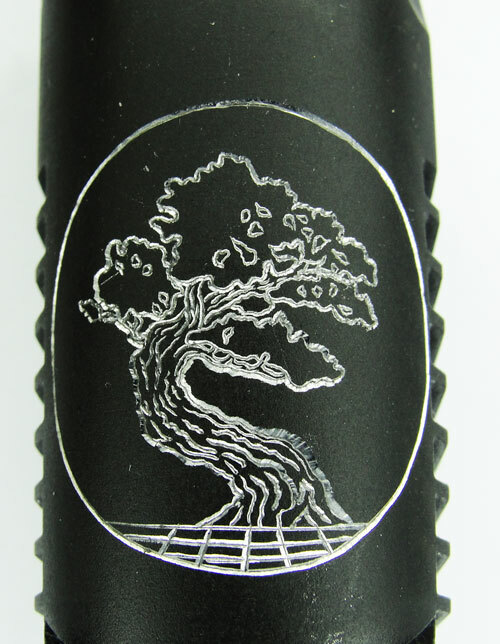 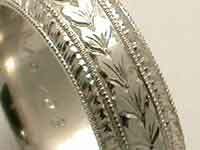 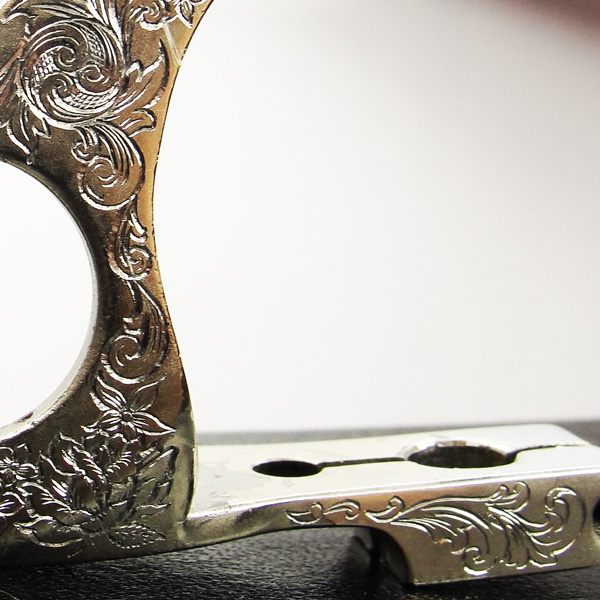 This is the first step in the Hand Engraving process. 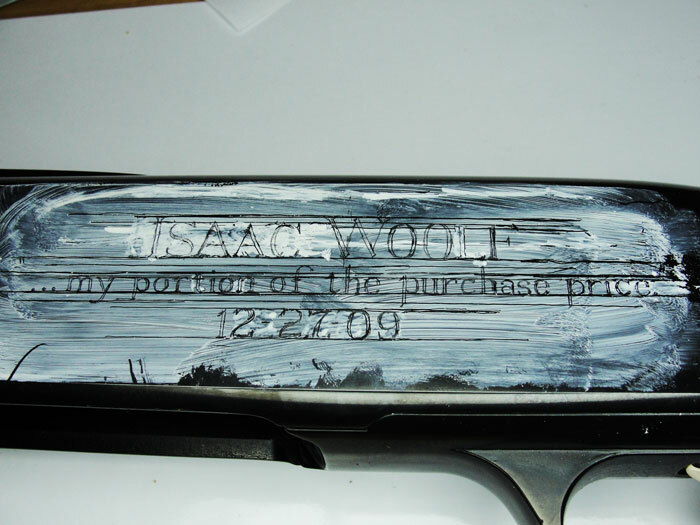 First white water color paint is applied to the surface to be engraved. 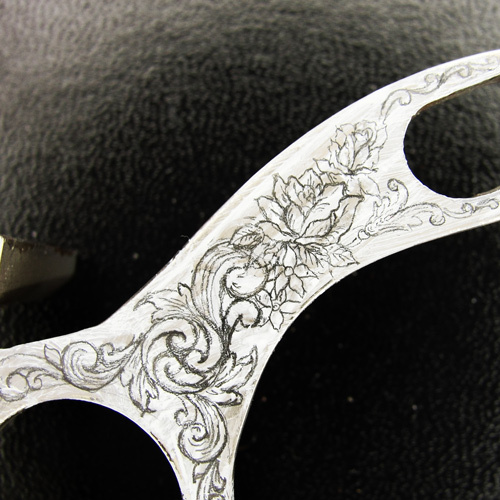 Then with a sharp pencil the design is drawn onto the piece. After the drawing is completed it is cut into the metal with a small hand held chisel called a graver. 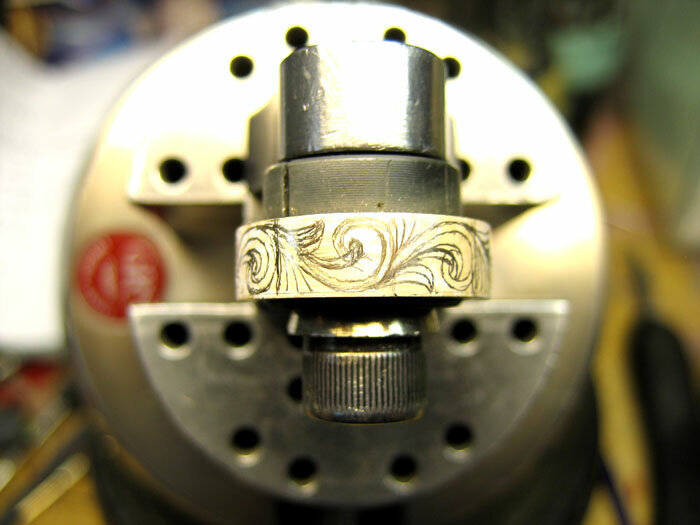 This is the ring after the drawing was cut into the surface. 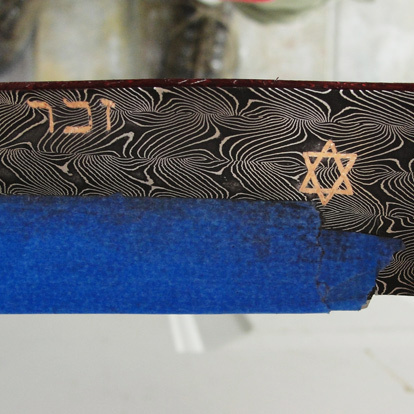 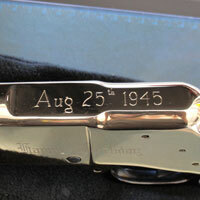 It is still being held in the Engraving Block. 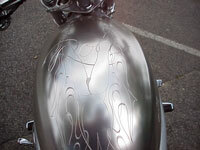 Jeffery had block letter V with Rod painted in script wrapped around the V saying VRod. He wanted to have a girls legs to be the V and a script Rod interlocked with the legs to say VRod. 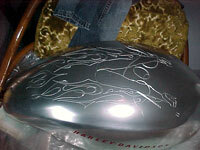 He also wanted to have flames filling the rest of the surface of the top of the cover. 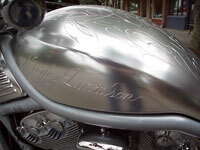 After he received the air box cover he sent me the fenders so I could engrave flames on them. 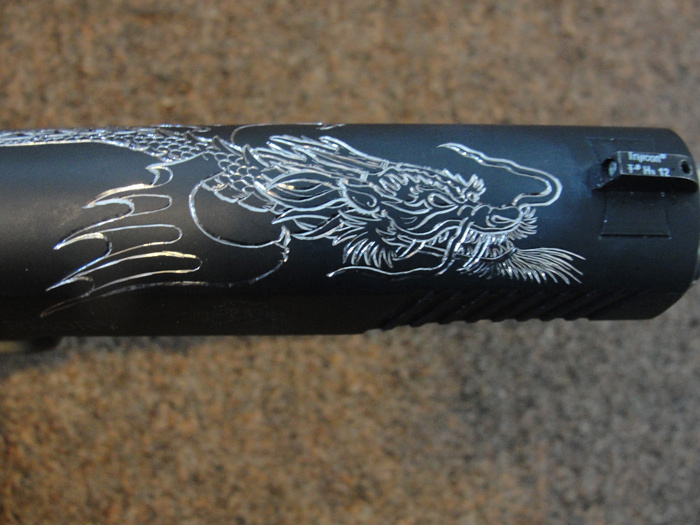 These are the pieces on the bike after engraving. 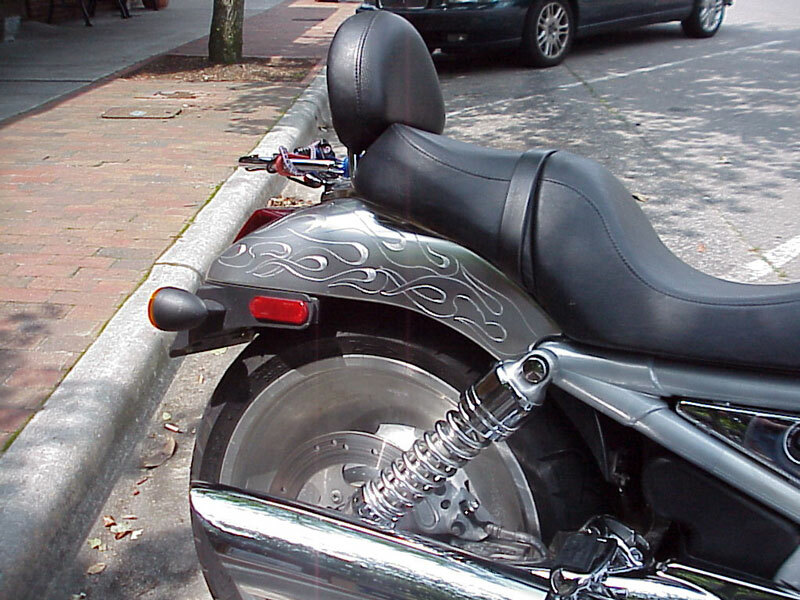 Harley Davidson was engraved on the side in a non-traditional font. This one she had the stones and an idea she wanted the center to have the old three bead look and the sides to have area of pave� followed by engraving down the shank. 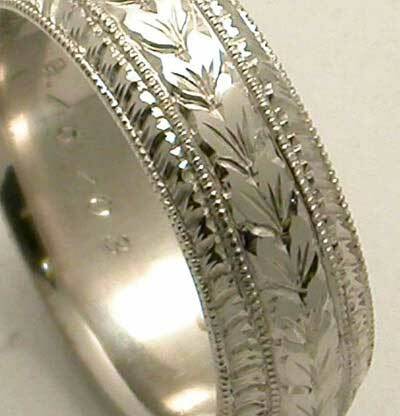 I engraved it with a pattern that I had found on a long piece of wheat type of grass I had picked while walking one day. 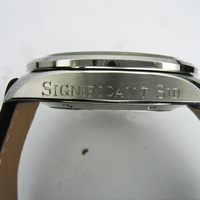 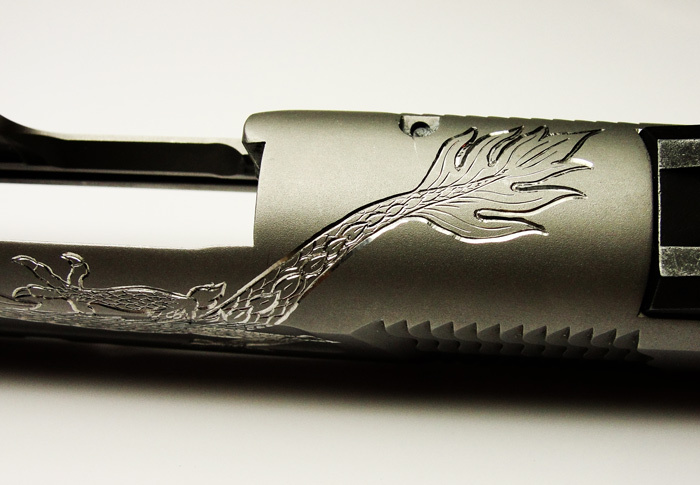 This is a picture showing how the engraving reflects the light and really stands out when seen in the right light. 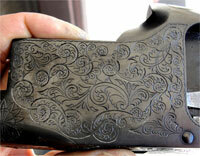 The gentle man wanted skulls and roses on the slide of his pistol. 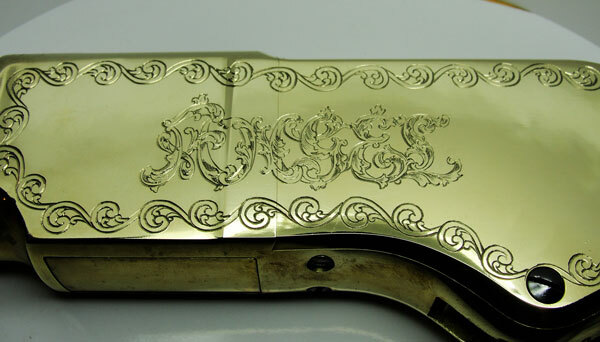 He gave me the slide and I engraved the skulls and the roses. 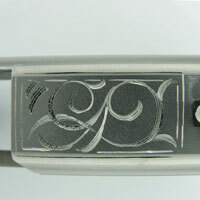 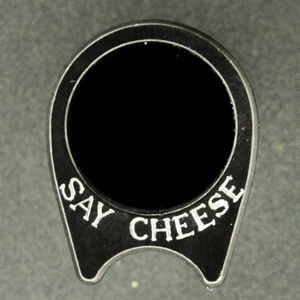 This is a ring that I engraved for My Buddy Scott French at French's Jewelers in Alpharetta Georgia. 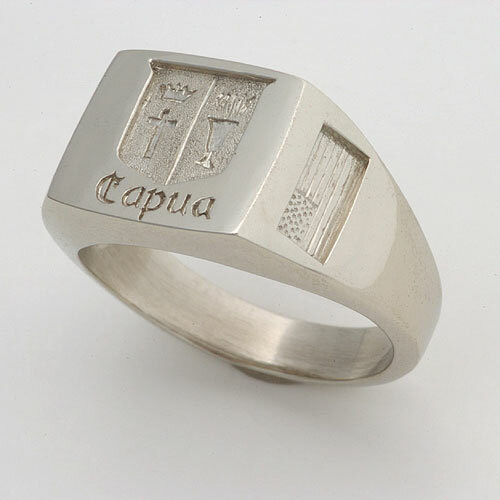 He made the ring and sent it to me for engraving. 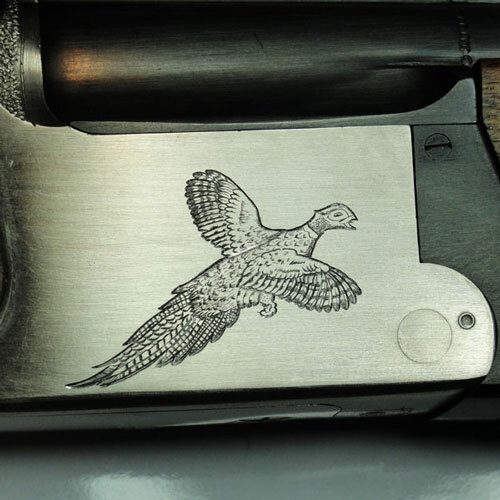 This is the finished piece after engraving. 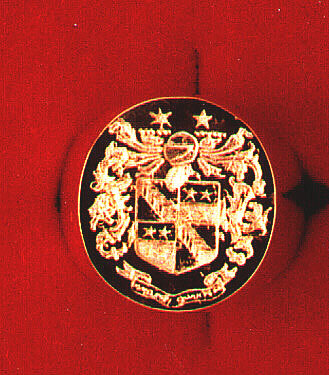 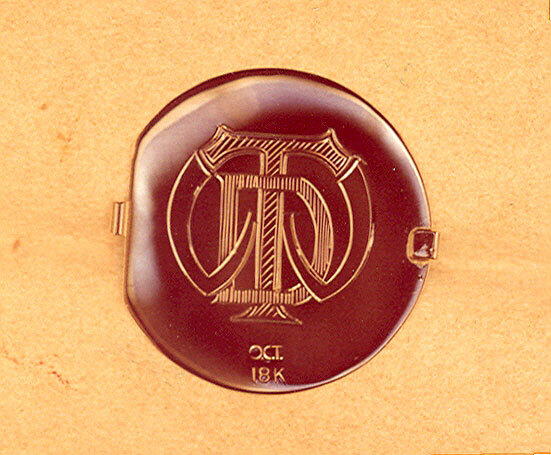 An intaglio Family Crest, made for pressing into sealing wax. 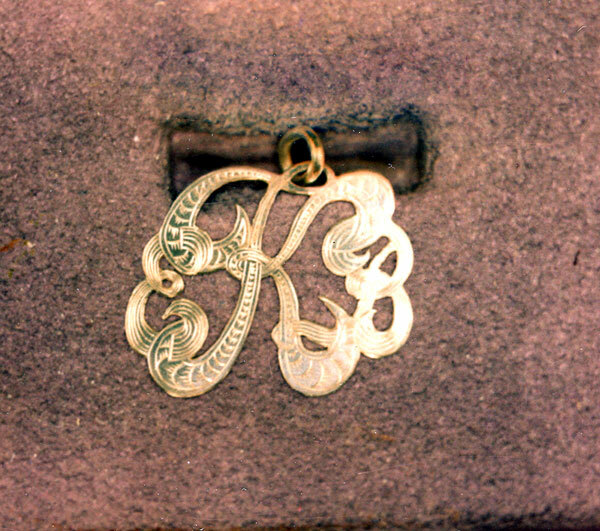 An interlocking pierced EBK monogram pendant made out of sterling silver. 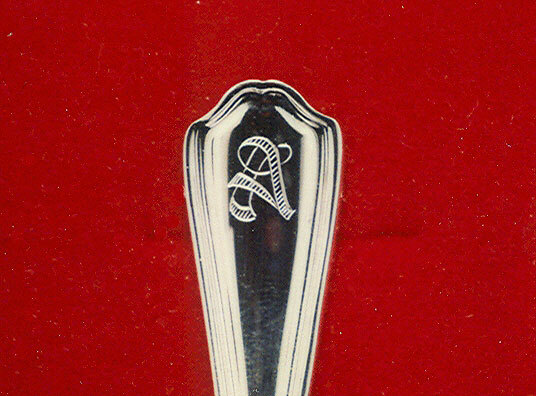 A Keramic Text "A" engraved on a spoon handle. 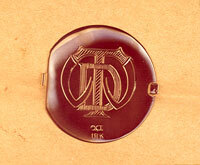 Another intaglio Family Crest, made for pressing into sealing wax. 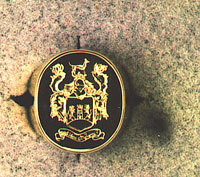 RMD monogram engraved on a signet ring with the background relief cut away and stipple finished. 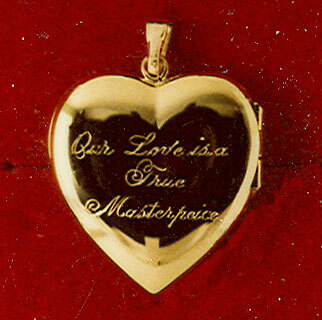 A 5/8 of an inch tall locket, with an American Round hand inscription. 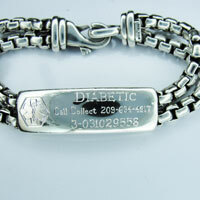 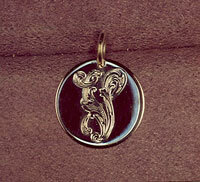 A small silver charm with a Leaf Letter "V", hand engraved on it. 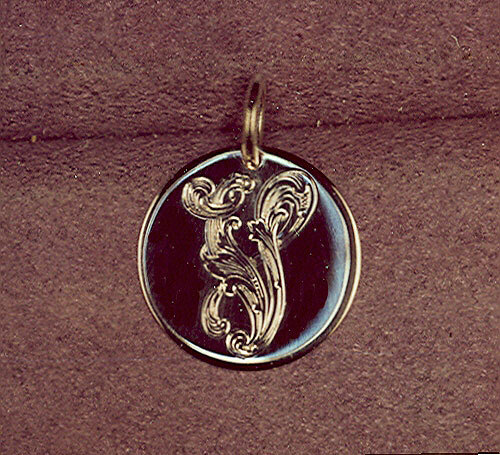 A leaf letter "F" hand engraved on the front of a locket. 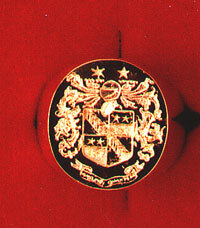 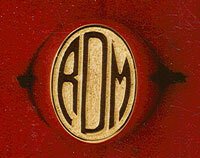 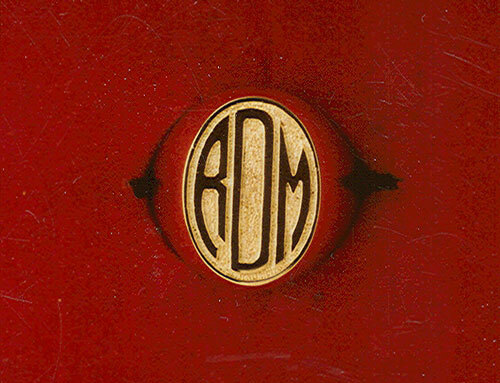 An interlocking WDT monogram on the back of a locket. 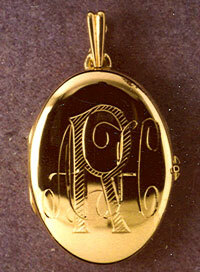 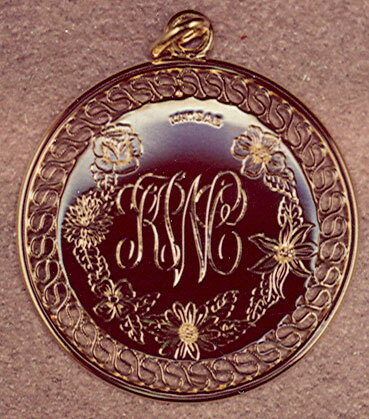 An interlocking two script "AHR" monogram on the front of a locket. 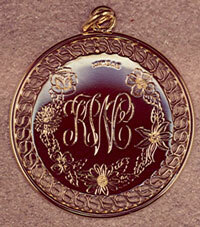 Hand engraved KCW interlocking verticall script monogram, with floral border. 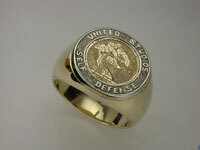 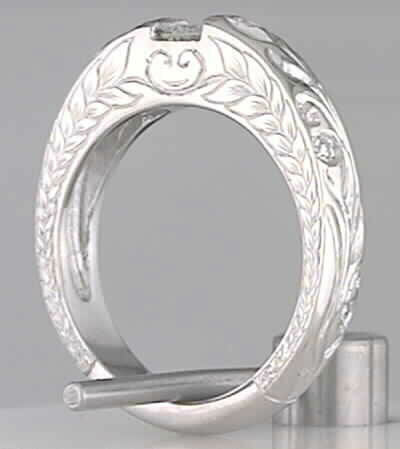 This is the other side of the above ring representing the American side of the family. 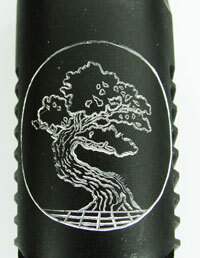 Copyright © 2010 - Engraver Dave; All Rights Reserved.